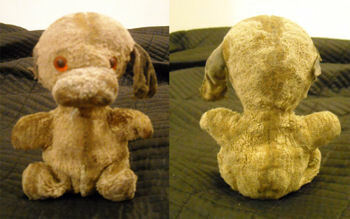 I’m looking for my boyfriend’s lifelong toy dog Max that he received as a present at birth in 1983 in the UK. He has no tag or anything like that. Max is a 6 inches tall tan/fawn coloured dog with orange glass eyes, which have black pupils. He has 2 brown ears (unfortunately most of his right ear was chewed off years ago). He has a lighter shade of fawn/tan on his snout. He also used to have a nose (not sure what material it was made out of) and a little tongue – both of which have fallen off down the years. He does have fur, but as you can see in the photos it is well worn. He has never had a tail, and sits upright – more like a teddy than a dog. His paws and feet are like a teddy. Any information you are able to pass on about Max I’ll be very grateful for! Is it possible that Max is pre-owned or passed down from the gift giver? His body style, type of plush, and glass eyes suggests that he was made in 50s-60s era. If I have to guess, it’s by Knickerbocker. Thank you so much for your advice.. i’m not 100% certain of whether he was new in 1983 so it is possible he is much older! I’ll have to look into that brand.. Thanks again I really appreciate your comment! Thank you very much Carrie! I wonder if it was Knickerbocker because the one on eBay doesn’t have the same eyes. But thanks alot for the tip!